Our minor league Farm Reports were somewhat disrupted by the Brewers trade of J.J. Hardy for Carlos Gomez on Friday (check out my thoughts on that here). Today we continue our look at the Crew's depth with third base, a position of some contention from the big league on down. This group features a lot of big time questions, and potential some very good major league players. 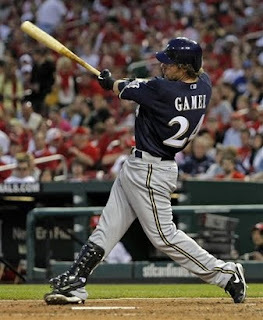 And yes, we will still give Mat Gamel prospect status even though he is no longer a major league rookie. Don't read too much into that number five player, the only real prospects of note are the top four in that group. And in that top four there will soon be a sizable logjam. Wheeler had a nice year with Brevard County, batting .268 with 64 driven in, certainly a good enough year to warrant a move up to Double-A. He showed good plate presence, posting a .370 OBP and has put up back-to-back good years. In 2008 he drove in 87 while slugging 13 home runs. Adam Heether (left) is an interesting player, comparable in a lot of ways to Casey McGehee. Heether will likely get a chance at making the big club as a utility player, he's seen time at second base, third base, shortstop and in the outfield. 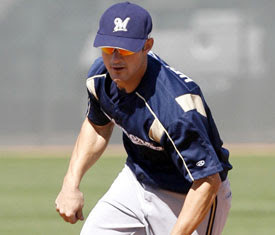 He had a big year in 2009, batting .296 with 18 home runs and a .396 OBP. All that could mean though, is he's good at taking advantage of minor league pitcher's mistakes, of which there are many. Next is where the logjam demonstrates itself, Taylor Green was considered a very good third base prospect prior to 2009. Then he had wrist surgery before the season and struggled for the duration. 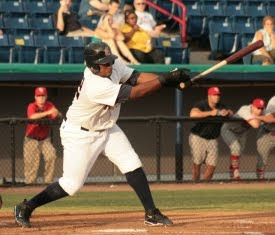 With Huntsville he hit just .258 and hit only five home runs, certainly not worthy of a promotion on numbers alone. Finally, there is Mat Gamel. Gamel didn't have a good year, but he had some very good moments. His development was clearly stunted by his time spent on the Milwaukee bench but you can still see the quality of player he might be. In triple-A he hit .278 with 11 homers and 48 driven in. The big concern, of course, is strikeouts and that's something he'll have to improve on in the majors. Now for some hypotheticals, if Green and Wheeler (right) are both assigned to double-A then someone loses valuable playing and development time. If Green and Gamel are both assigned to triple-A, same problem. The DH opportunities are too few to consider that a viable option. The long and short of it is, the Brewers need to trade someone. Whether it's Casey McGehee, Gamel, Green or Wheeler, there are only so many at-bats to go around. Depth is a beautiful thing isn't it?